This study was carried out between March 2015 and February 2016 with the aim of determining the seasonal variation of acetylcholinesterase (AChE) activity in brain tissue of Capoeta umbla (Heckel, 1843) caught from Pülümür Stream (Tunceli). The seasonal fluctuations in the AChE activity of C. umbla which caught between the 39̊ 06' 19''N- 39̊ 36' 56''E (A) and 39̊ 11' 36''N-39̊ 41' 36''E (B) coordinates of Pülümür Stream, were studied over a period of one year. The enzyme activity was higher in spring and summer than in autumn and winter. In addition, the minimum value for the AChE activity was determined in the winter season and the maximum value was determined in the spring. Bu çalışma, Pülümür akarsuyundan (Tunceli) alınan Capoeta umbla (Heckel, 1843)’nın beyin dokusundaki asetilkolinesteraz (AChE) enzim aktivitesinin mevsimsel değişimini belirlemek amacıyla Mart 2015 ile Şubat 2016 tarihleri arasında gerçekleştirildi. Pülümür Akarsuyu’nun 39̊ 06' 19''N - 39̊ 36' 56''E (A) ve 39̊' 11' 36'N - 39̊ 41' 36''E (B) koordinatları arasında yakalanan C.umbla' nın AChE aktivitesindeki mevsimsel dalgalanmalar bir yıl boyunca incelendi. Enzim aktivitesi, ilkbahar ve yaz aylarında sonbahar ve kışa kıyasla daha yüksekti. Ayrıca, AChE aktivitesine ait minimum değer kışın, maksimum değer ise ilkbaharda tespit edildi. Chuiko GM, Kozlovskaya VI. 1989. Seasonal fluctuations of brain acetylcholinesterase activity in perch (Perca fluviatilis L.). Physiology and Toxicology of Hydrobionts, Yaroslavl State University, Yaroslavl. p. 27-37. Gadzala-Kopciuch R, Berecka B, Bartoszewic J, Buszewski B. 2004. Some considerations about bioindicators in environmental monitoring. 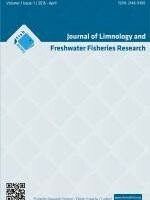 Polish Journal of Environmental Studies. 13(5): 453-462. Hogan JW. 1970. Water temperature as a source of variation in specific activity of brain acetylcholinesterase of bluegills. Bulletin of Environmental Contamination and Toxicology. 5(4): 347-353. Lowry OH, Rosebrough NJ, Farr AL, Randall RJ. 1951. Protein measurement with the Folin phenol reagent. J Biol Chem. 193(1): 265-275.